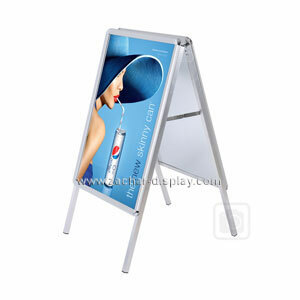 A-Boards are excellent for outdoor and indoor applications. They are very effective, stable, free-standing, double-sided signs used as sidewalk signs and storefront signs. 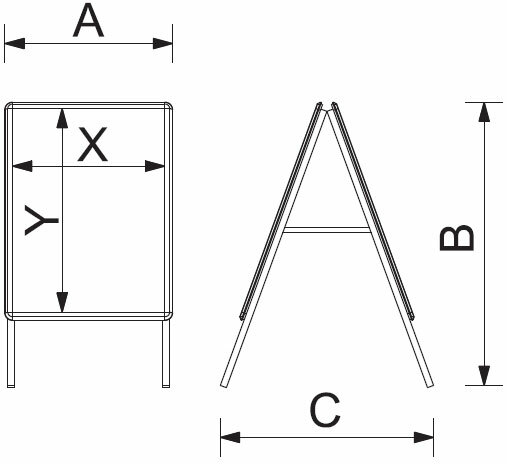 The A-Board Classic is based on aluminum snap frame technique. These sandwich board signs are designed for outdoor use, they are equipped with non-corrosive metal back panels and integrated water outflow holes in the bottom profiles of the frames. The included UV stabilized antiglare film protects the posters from bleaching out. The A Boards are anodized in silver colour. They are ideal for posting messages for the public, customers, visitors, tenants and employees. These display boards can be found in community centres, recreation centres, stores, local government, schools, hospitals, subways, office buildings and many other locations.